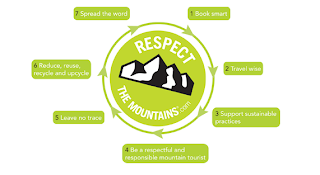 Ambassador of Respect the Mountains. 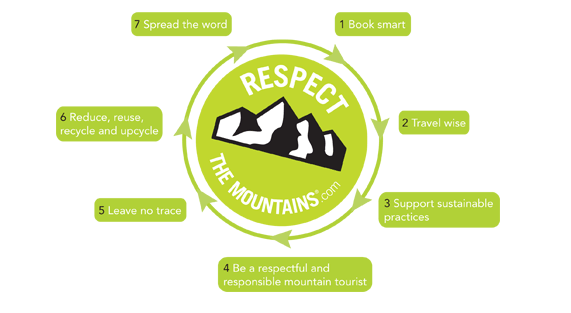 Last Monday I was invited at Respect the Mountains (RTM) headquarters in Amsterdam. And now I'm suddenly ambassador together with other awesome mountain athletes like Xavier de la Rue and Bas Elhorst. Not that I'm now going to force you to eat macro-biotic food, live of the rythm of the moon, only wear vegan clothing and never ever use your car again. RTM rather wants you to enjoy the mountains. Please, enjoy and love those massive rocks as much as you can! Only just make sure others can enjoy the mountains as well, also in the future. With simple things like taking the cigarette ends with you, carpooling when possible, eat local food if available and be kind to the locals they represent themselves. 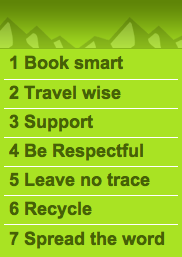 They'd put this together in a scheme called 'the 7 ways'. Other practical and fun things they do are for example the Envirotrek. It basically means you clean a mountain track for half a day and for the rest of the day you're invited to take part in MTB clinics, kayaking, rock climbing or other fun stuff. In the evening you all get a big, big BBQ and suddenly you did two things in one: having mountain fun & being respectful in the mountains. RTM also sells small things that can help you 'respect the mountains'. Environmental friendly wax products but also tiny rubbishbins for cigarette ends.